Alas G1 winning stallion BON AURUM has succumbed to his arthritic knee and will now be retired from racing. 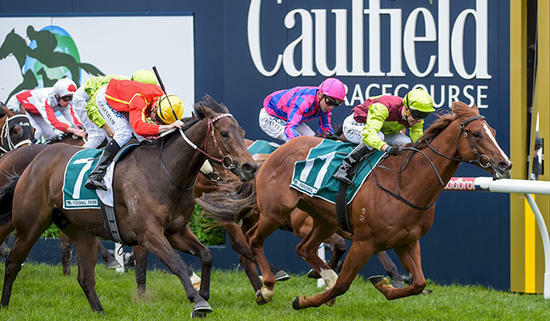 The 5YO stallion had 15 starts winning 5 times once as a 2YO, twice as a 3YO including two stakes wins one at Flemington and the other at Caulfield (Caulfield Guineas Prelude G3) and two as a 4YO including the G1 Rupert Clarke Handicap over 1400m. His earning at the end of his career were just shy of $600k. He was by BON HOFFA who also won the G1 Rupert Clarke back in 2007. BON HOFFA stands at stud and has a very successful career siring over 140 winners winning 390 races and $9.5m in prizemoney. Both raced in our colours and we are very proud of their achievements both on and off the track. Leading Victorian trainer Ciaron Maher rated BON AURUM as one of the toughest horses he has trained. BON AURUM now heads off to stud where we are sure he will emulate the deeds of his sire and prove to be a producer of tough fast affordable horses and we look forward to racing a few.